Back in 2011, I lived in Aida Refugee Camp for nine months before moving to work in Ramallah. For me, Aida Camp was a safe place. A place where I recognized almost everyone’s face, and where most people recognized me. Aida was safe for me because it provided that sense of being in a small town that I never really had growing up. I was never alone. I knew and loved my landlords. Kids played football in the street…You get the picture. This is how I remember Aida Camp. It’s what I told my parents about Aida Camp. But Aida Camp is not a ‘safe place’. Well, perhaps it was for me and all the other young, idealistic internationals staying there. But for the Palestinians who are born, live and die there, it is a home in which they are vulnerable to attack. The truth is, that while I slept safe in my bed at night, young men and boys were arrested. That while I slept, IDF tanks rolled in through the gates of the Wall, through the narrow streets of the camp. I would wake up in the morning and hear of the two or three teenagers who were arrested, how their families were awoken in the middle of the night by a banging on the door. How the families were kept in the living room while the boys were beaten and taken away. How their parents were never told where they were being taken. Or why. Perhaps the boy threw a stone at a soldier. Or an armored truck. Or the Wall. Perhaps he did absolutely nothing at all. Did it even matter at that point? At the point when the men and women came with guns to take him from his bed? Why am I writing about this now, now that I’m far away in London, studying about Security Council Resolutions and writing essays about how to legally classify various international armed conflicts? I’m writing now because sometimes you hear a piece of news that jolts you back to reality. That’s what happened to me this morning. Sitting down at my desk with a fresh cup of coffee, I saw that yesterday, Mohammad al-Azza was shot in the face. Mohammad (or Mousa) is a photographer who works at a youth center in Aida Camp. I cannot claim to know Mousa well. I’ve only ever met him a few times. But he’s a close relative of my old landlords, and is known in Aida for being kind, outgoing, and funny. Mousa was shot by the IDF with a rubber-coated steel bullet. He was shot because he photographed them as they entered the camp. According to +972 (where you can read more details about the attack), Mousa is now in the hospital, recovering. Over the last few months, things in Aida Camp have been heating up. More clashes, more tear gas, more sound grenades, and more shootings. Two kids have been shot over the past two months. One of them died. I suppose that, for most residents of Aida, these incidents aren’t new. Anyone alive during the first years of the new millennium remembers the pain and violence of the Second Intifada, during which the IDF fully occupied the camp. Many buildings around the camp still bear bullet wounds. So do many people. It’s all just part and parcel of that pesky Occupation, I guess. Other posts by Beth Miller. Al Quds Belongs to Muslims: BREAKING NEWS | Clashes now in Aida refugee camp. Israeli soldiers inside Aida camp are shooting lots of tear gas and rubber coated bullets..
Aida (Arabic: عايده‎) (also spelled ‘Ayda) is a Palestinian refugee camp situated 2 kilometers North of Bethlehem and 1 kilometer North of Beit Jala in the central West Bank. Named after a famous coffeehouse (maqhah) located on the site in the early 1940s, Aida camp was established in 1950 and covered an area of 66 dunams. According to the Palestinian Central Bureau of Statistics, the camp had a population of approximately 3,260 refugees in mid-year 2006. It is the location of the Al Rowwad Cultural and Theatre Training Center. 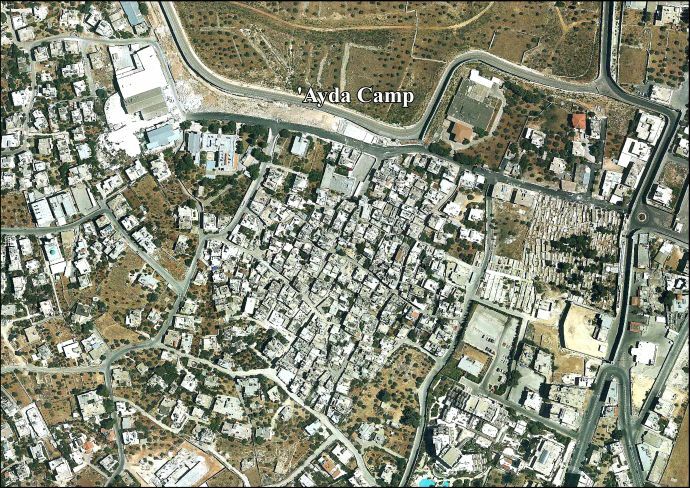 The Aida Refugee camp is adjacent to a new 4-star hotel.